I knew I'd seen this movie before! Bolted upright out of a sound sleep at 2:30 this morning with the realization that both the gals haunting my nightmares had been played by Laura Dern in two different movies! 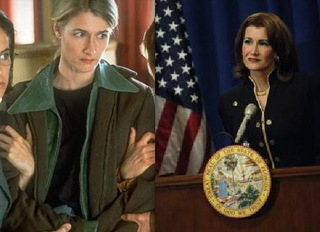 Laura Dern as Reality TV's own Katherine Harris, the ambitious, over-coiffured local politician thrust opportunistically into the international media spotlight by the Republican party, in "Recount" (2008). And Laura Dern as the clueless unwed pregnant teenager girl manipulated by pro-choice lefties and anti-abortion Christians -- cynically spun as an agenda-defining "symbol" by all sides -- in "Citizen Ruth," directed by Alexander Payne ("Election," "Sideways," "About Schmidt"). I recommend both these movies ("Citizen Ruth" especially) as primers for understanding what's going on right now.